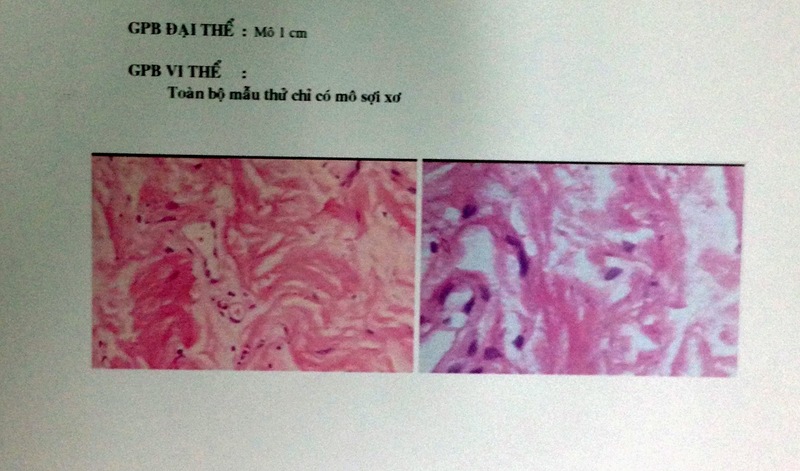 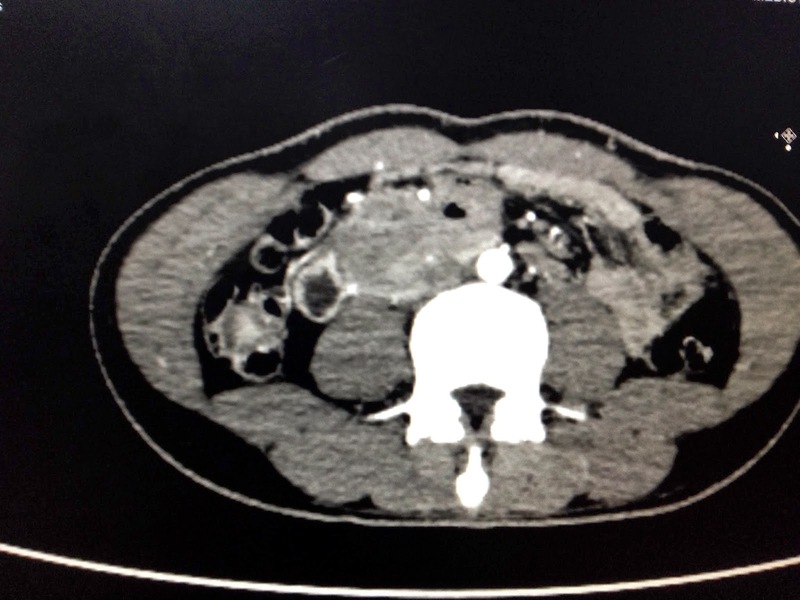 Man 31 yo, one week ago complained of epigastric pain and vomiting. 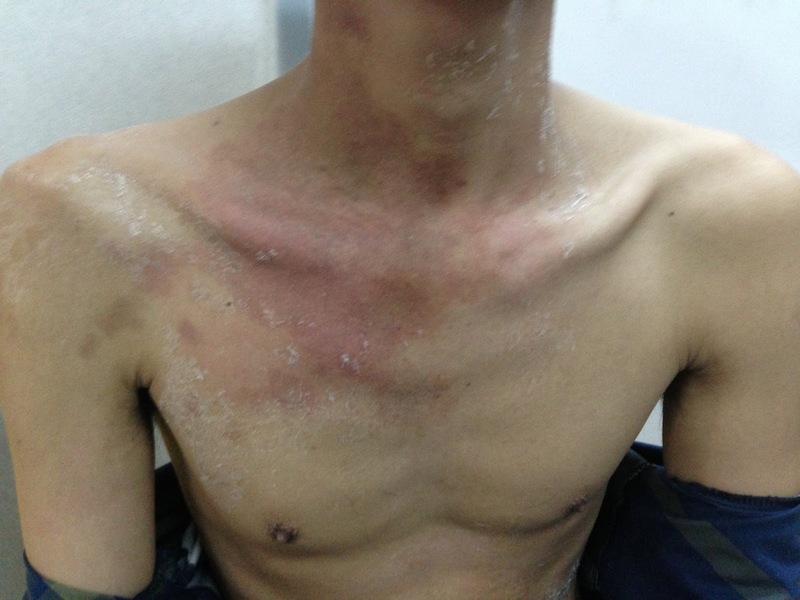 Clinical examination he had red skin on the right thorax and atrophied muscles of right arm. 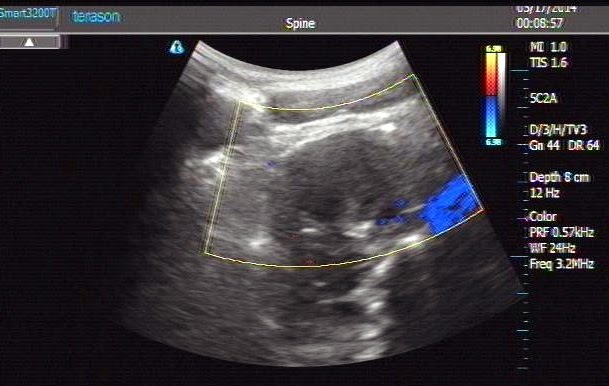 Emergent abdominal ultrasound scan showed one mass of 4cm located near the head of pancreas, at processus uncinatus which compressed duodenum..
Gastroendoscopy went down just to duodenum but nothing detected. 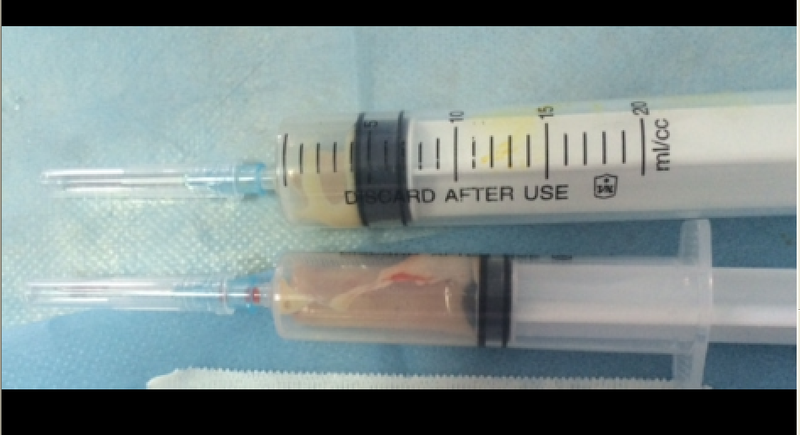 contrast injection was slowly enhancement , but it had air in the mass ( see 4 CT with CE pictures CT1, is angiogram of right axillary artery, CT2. 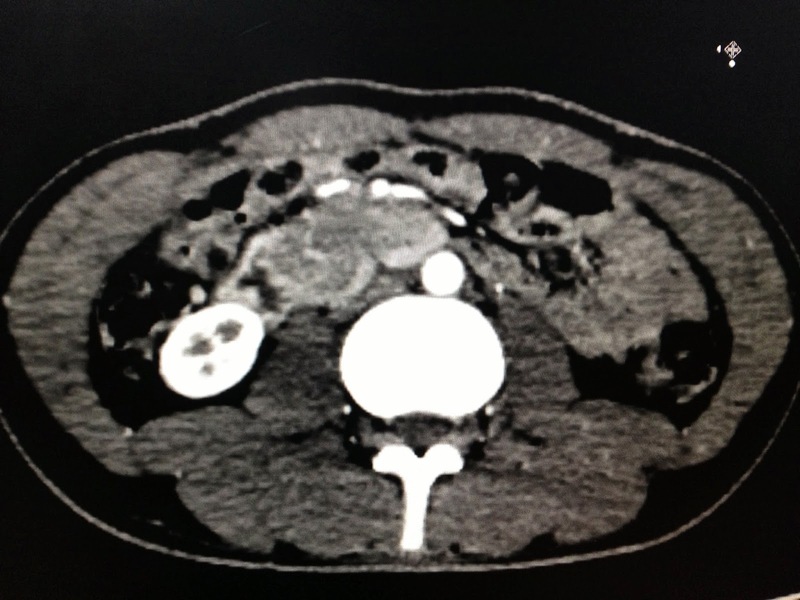 this mass with air inside, CT3, relation with right kidney and aorta, CT4 vascular SMA and mass). 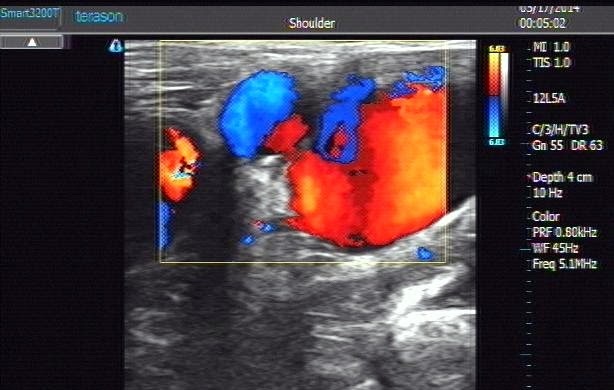 Blood tests were no abnormal. 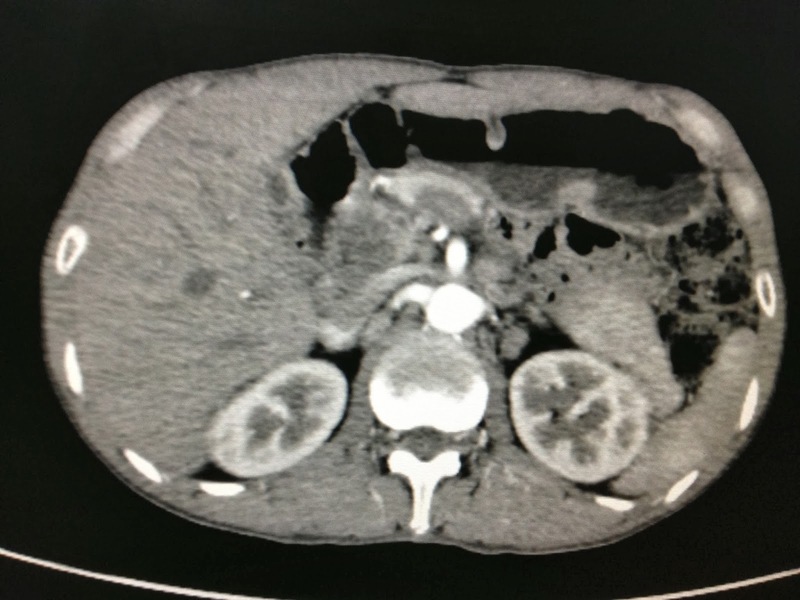 What is your suggestion for diagnosis ?. 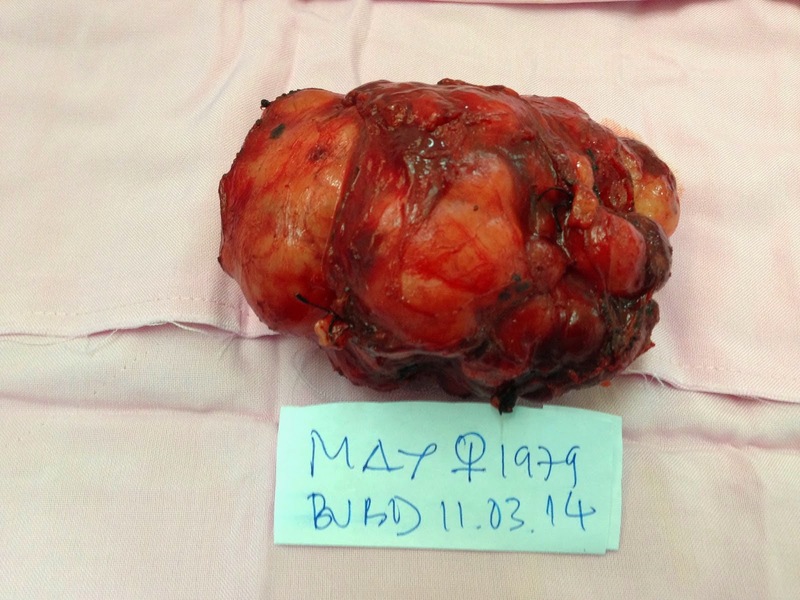 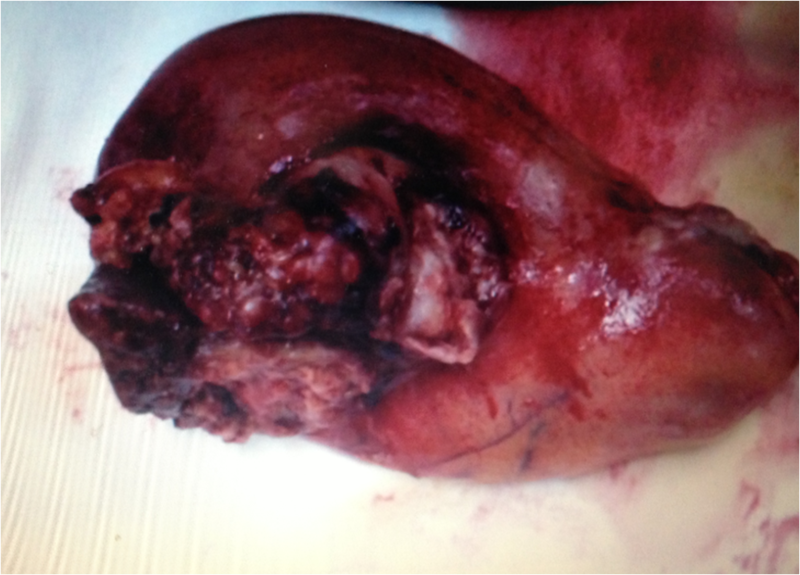 Operation laparotomy for biopsy this tumor and bypass anatomosis ; this tumor was covered SMA then cannot remove. 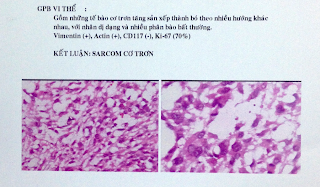 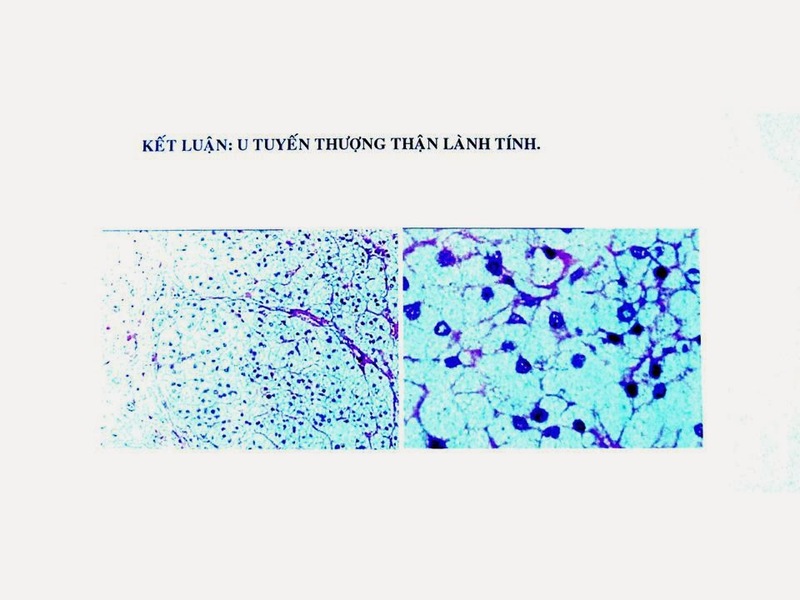 Microscopy is fibrosis, no cancer cell detection. 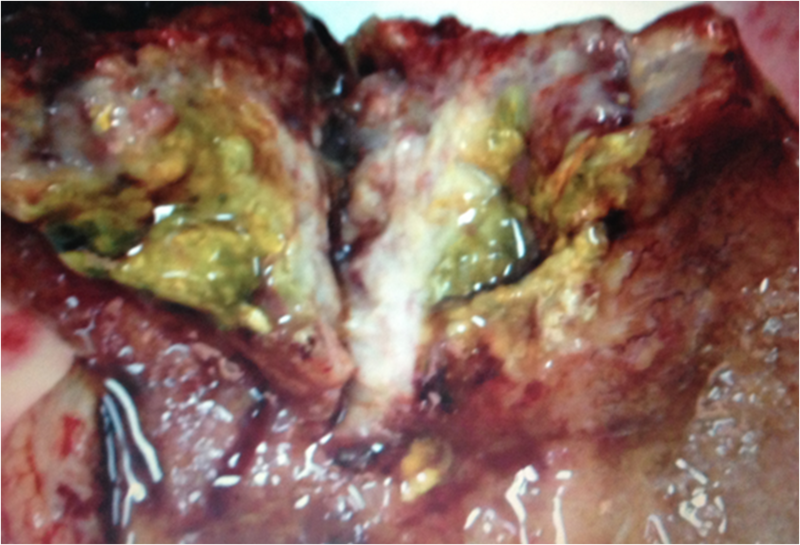 It is a fibrosis mesenteric case. 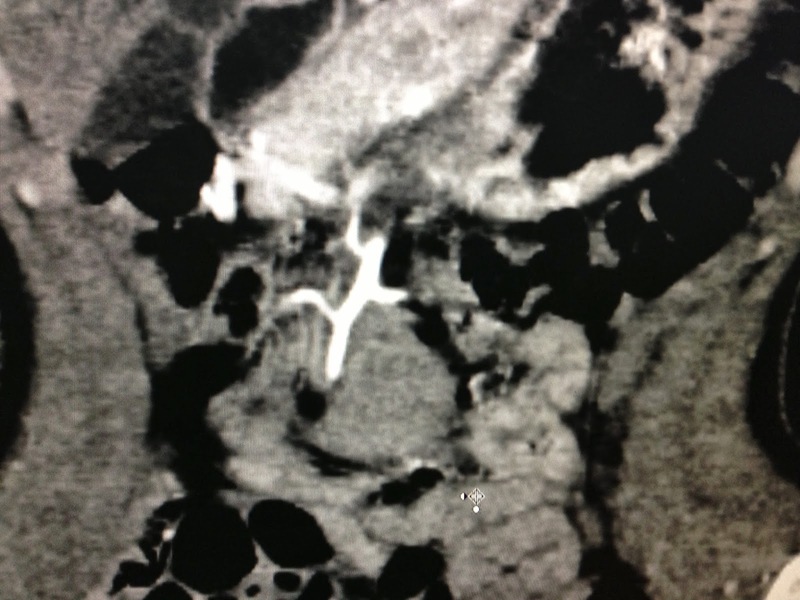 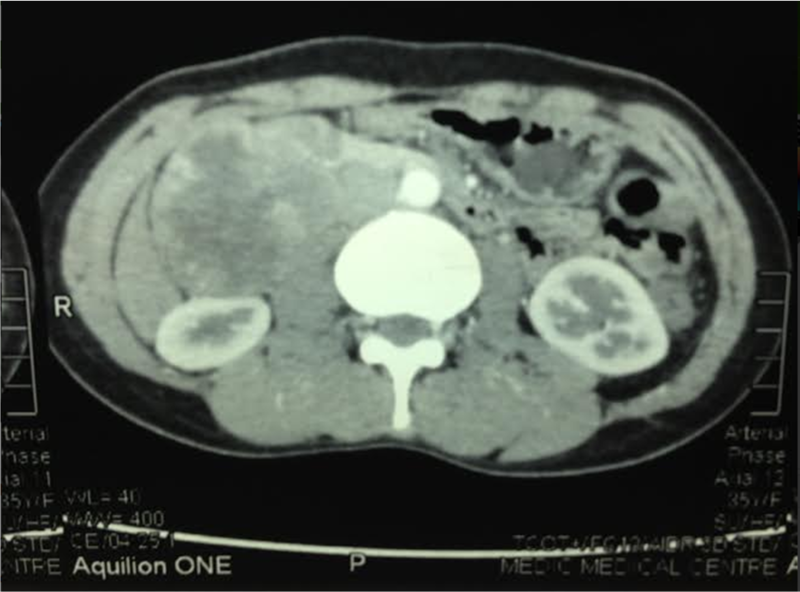 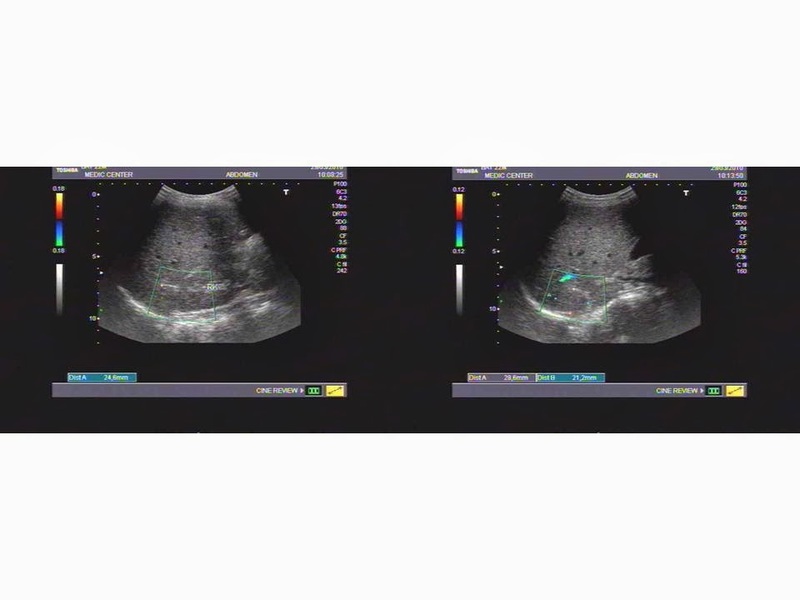 Discussion: this 31 yo patient, vomitting at the clinical onset, due to obstruction of upper GI tract . 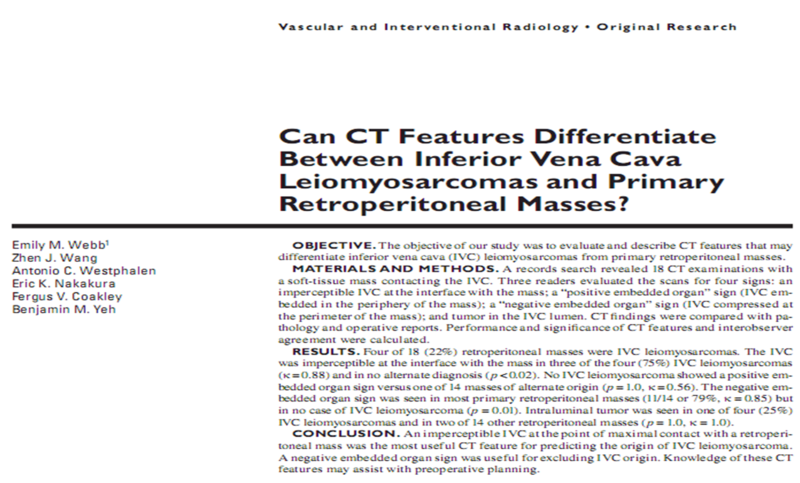 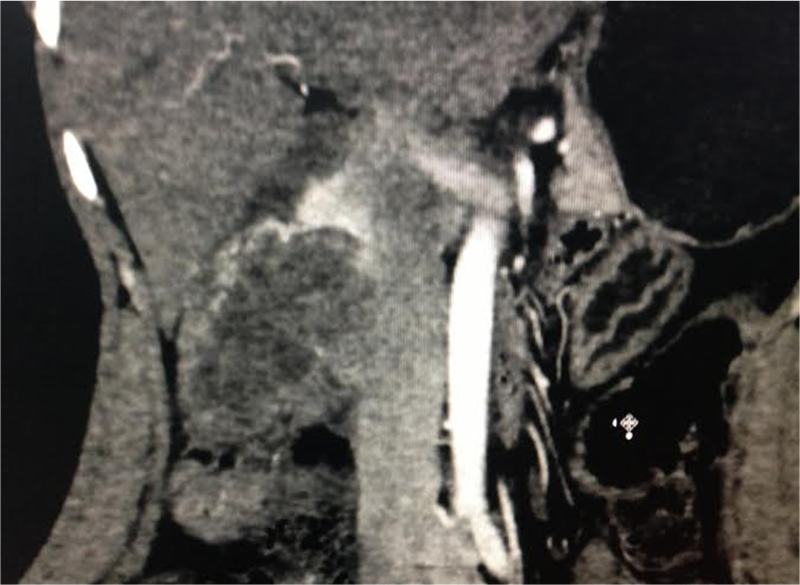 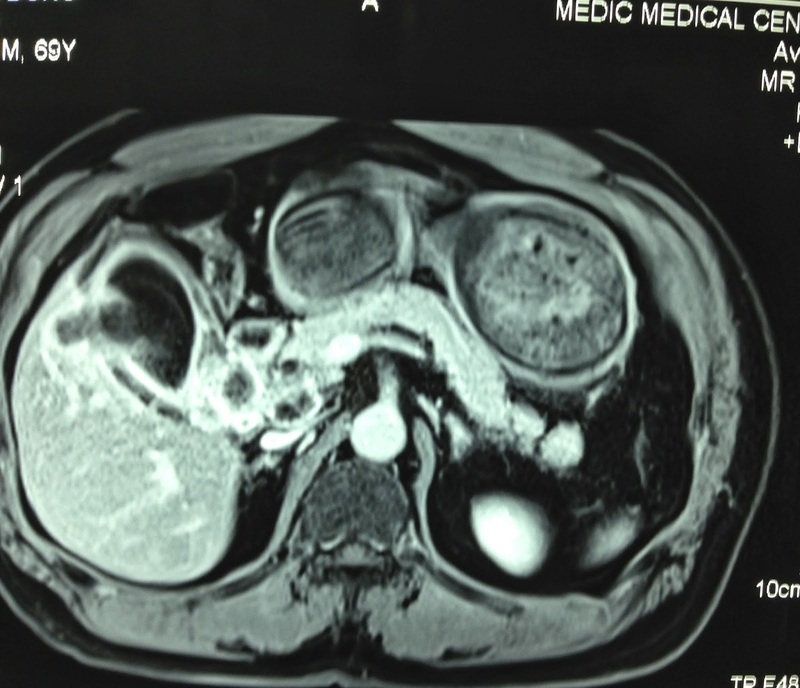 Ultrasound and CT showed the mass near the processus uncinatus of pancreas and SMA encasement . 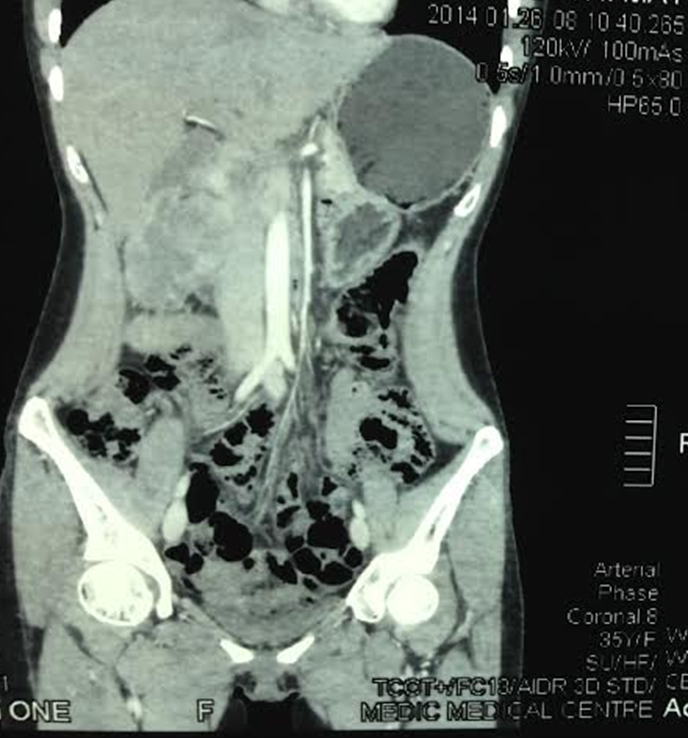 Operation cannot remove this tumor because it fixed to superior mesenteric artery, biopsy this mass with report no cancer cell,only fibrosis tissue suggesting a pseudotumor like mesenteric panniculatis. 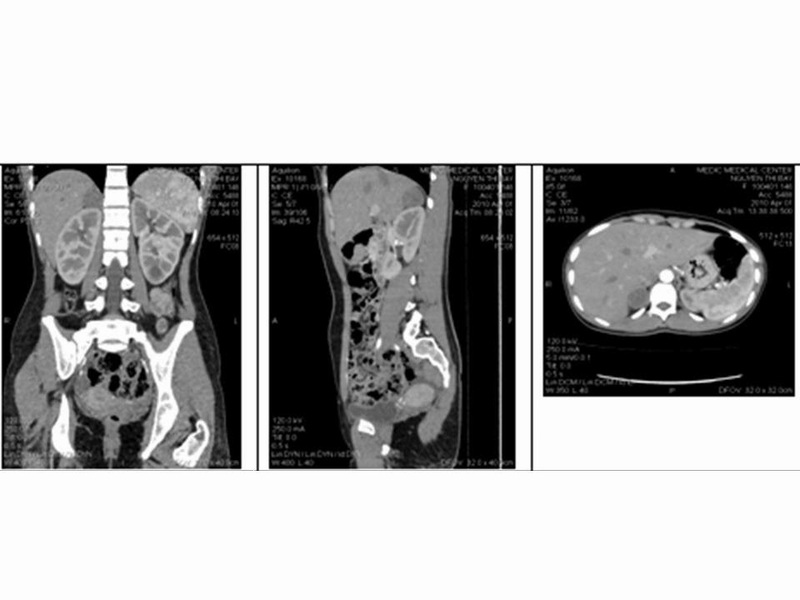 It is rare case response with corticoid treatment or with colchicine. 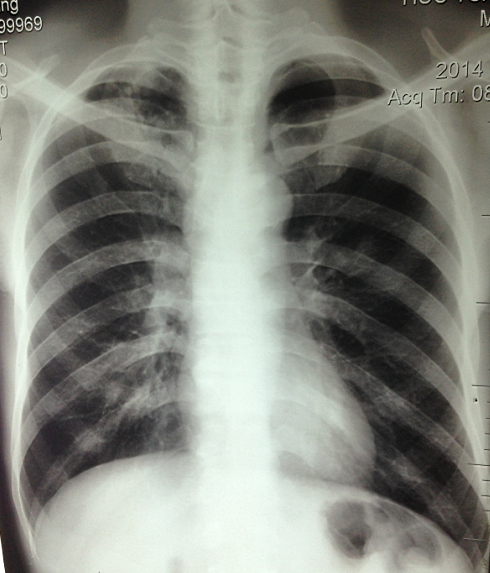 Female patient 22 yo from Daklak province, student. 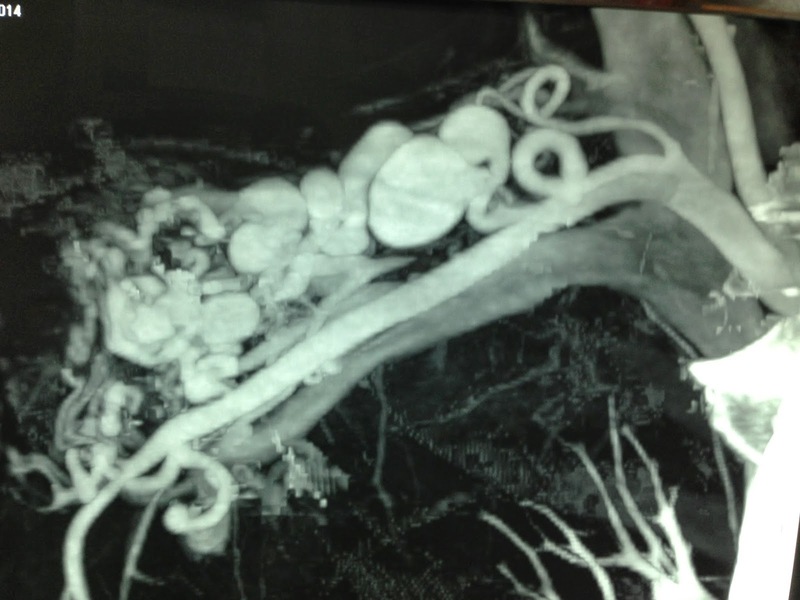 Arterial hypertension for 1 year and weknesss of 4 limbs in effort and remaining normal in rest. 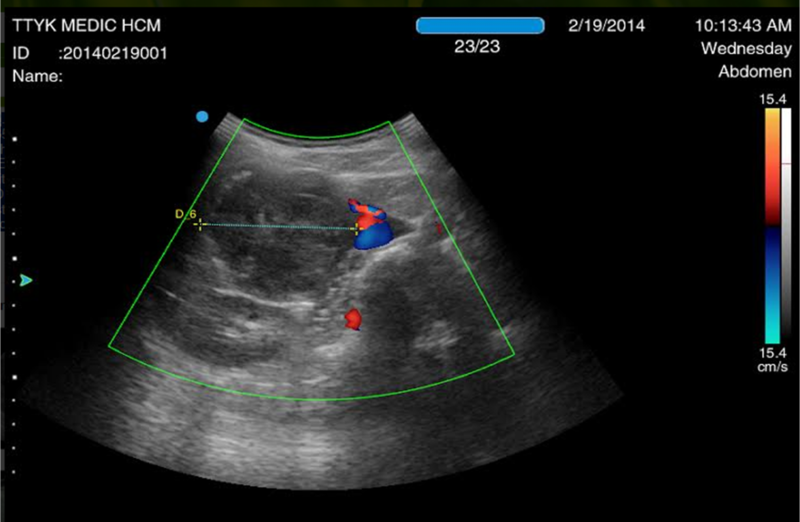 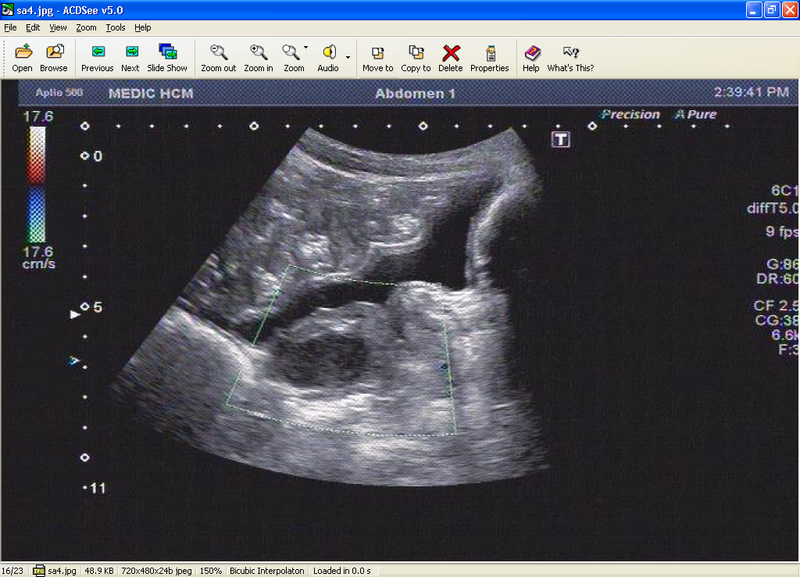 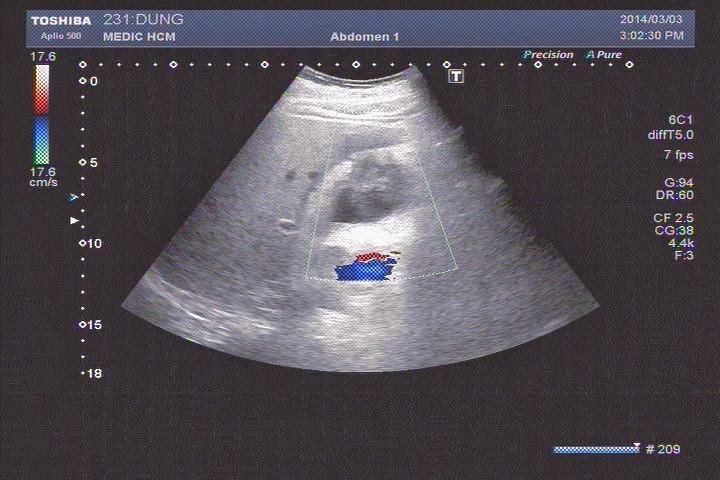 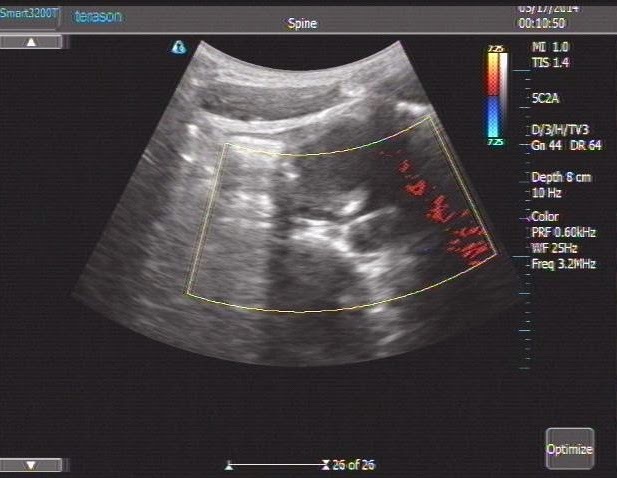 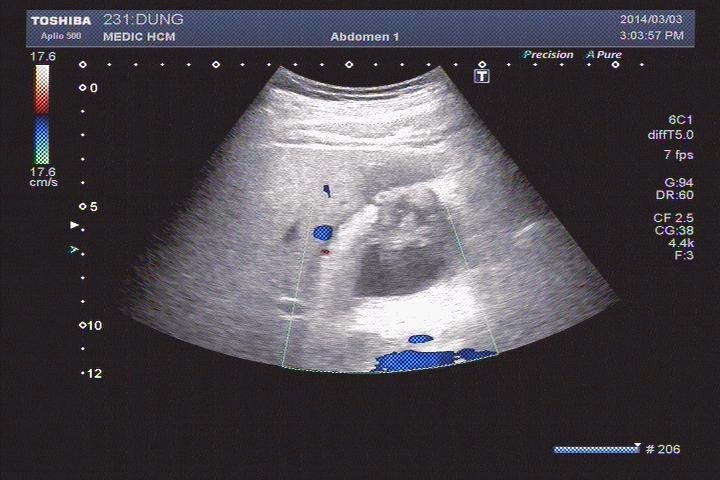 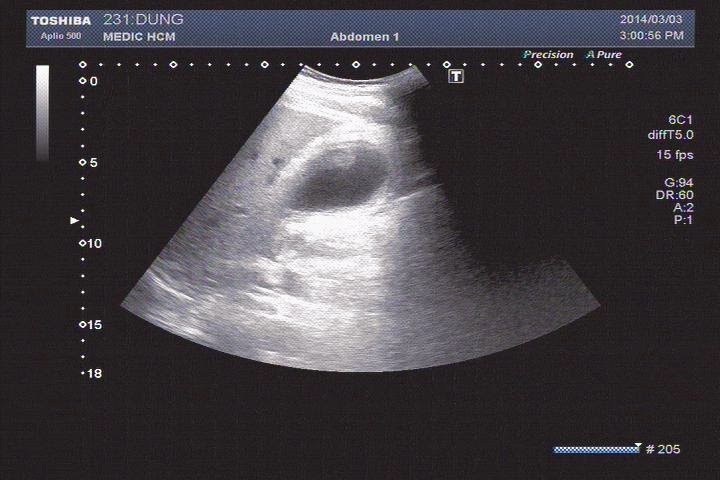 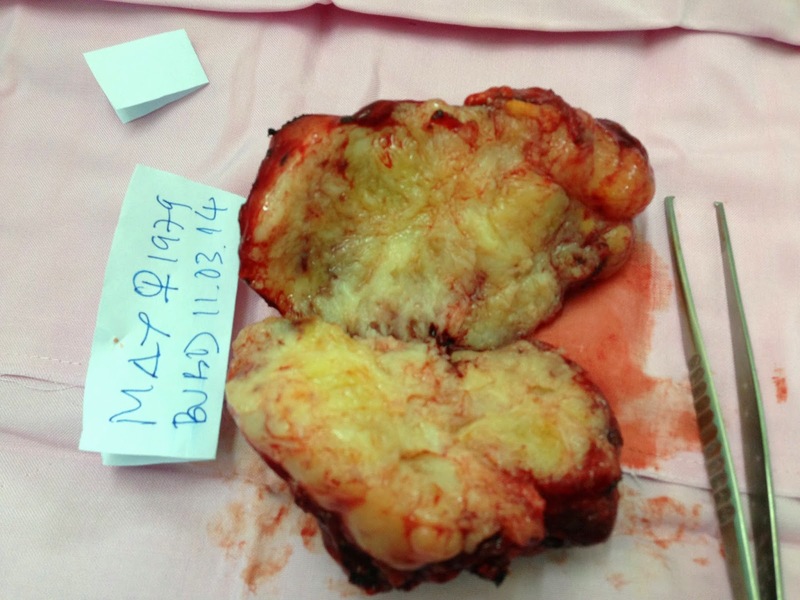 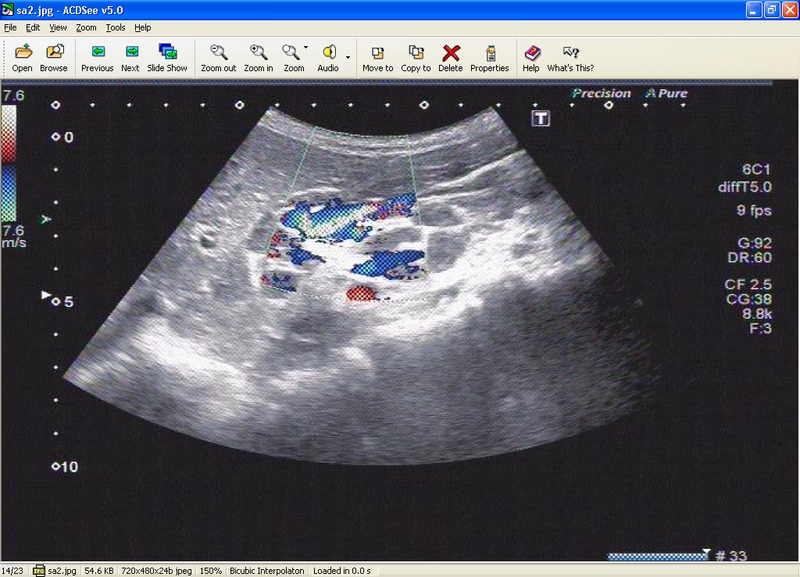 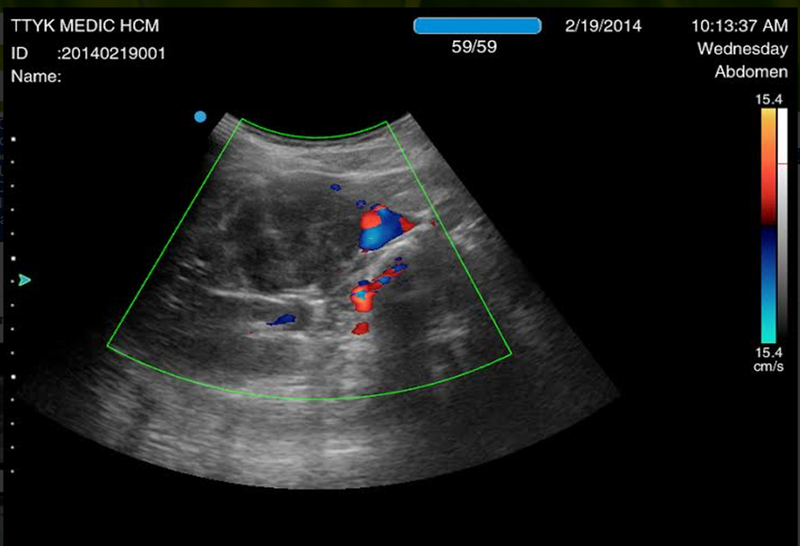 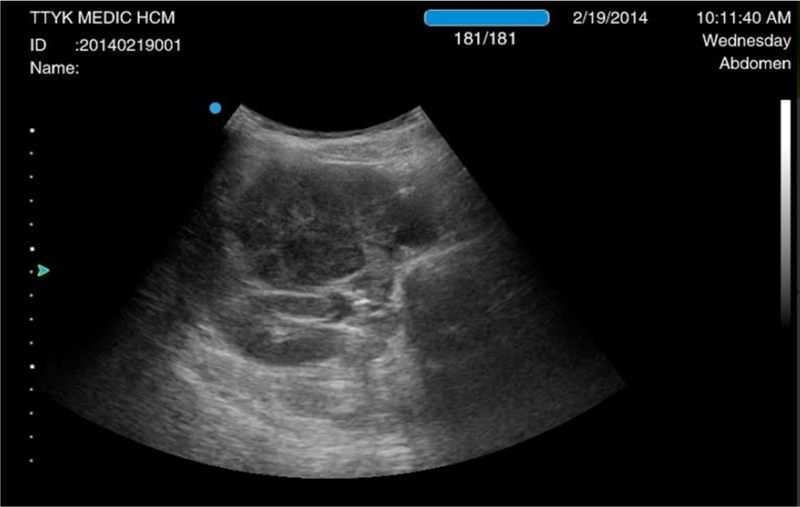 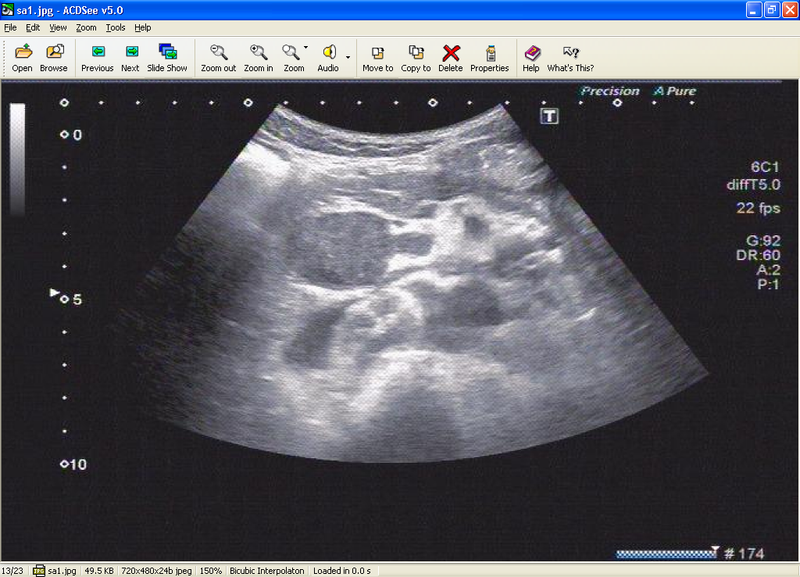 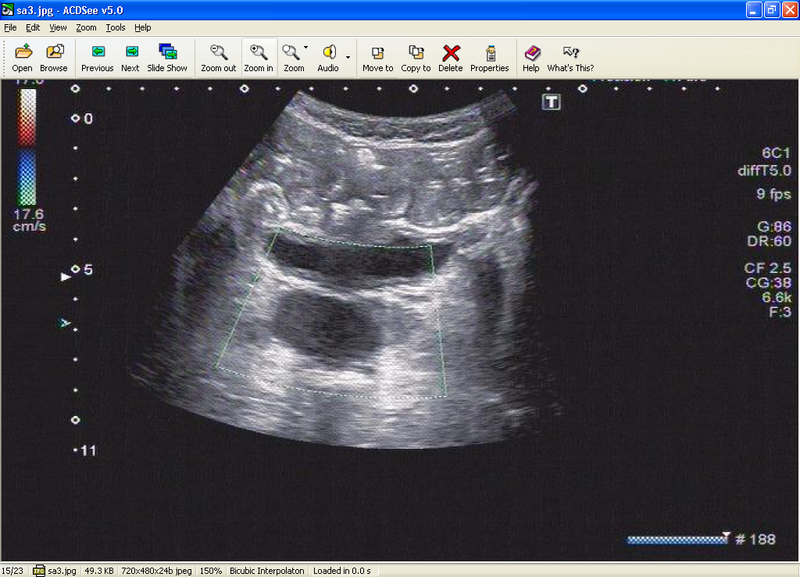 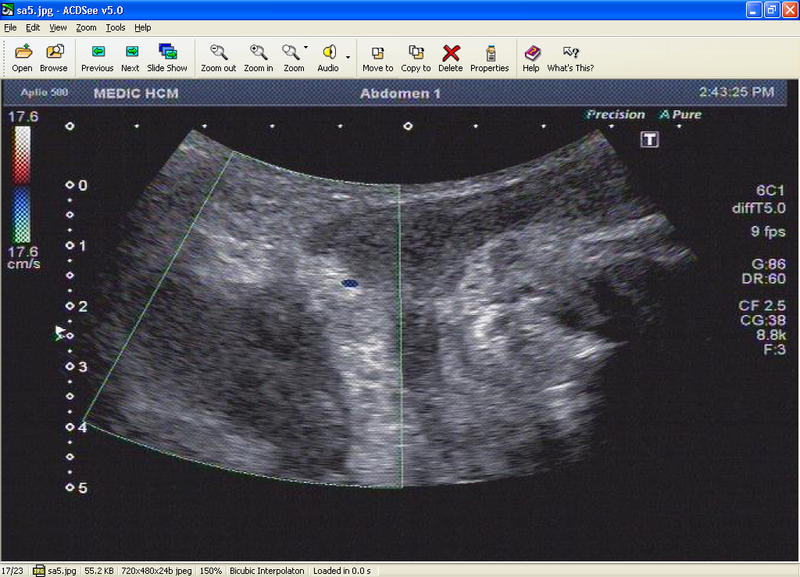 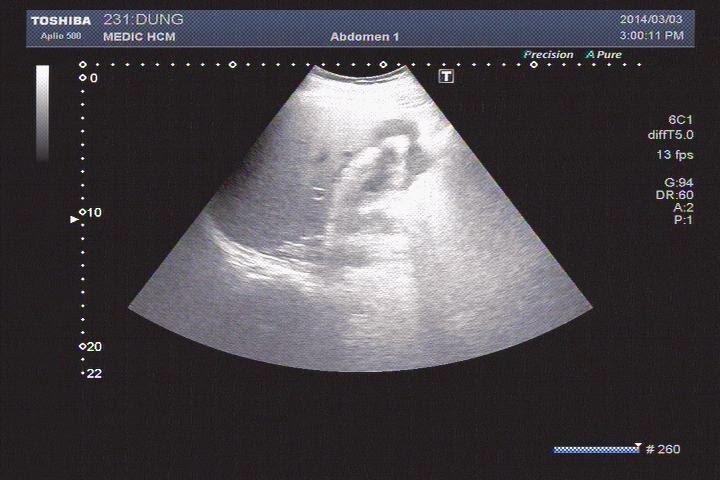 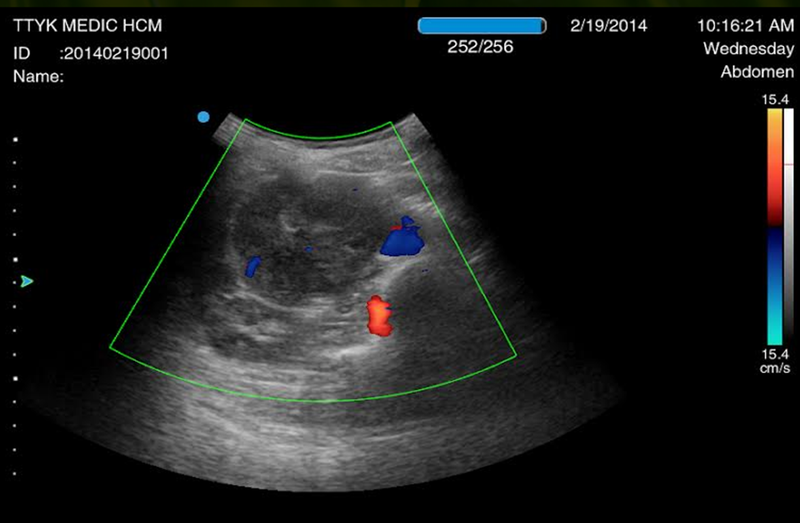 Abdominal ultrasound detected right adrenal mass of 21x28x24mm, well bordered which was thougt to be an adrenal tumor. 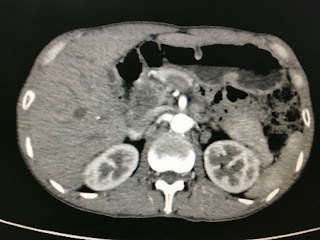 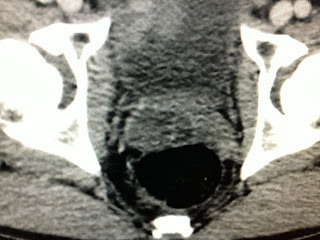 MDCT confirmed an adrenal tumor on right side. 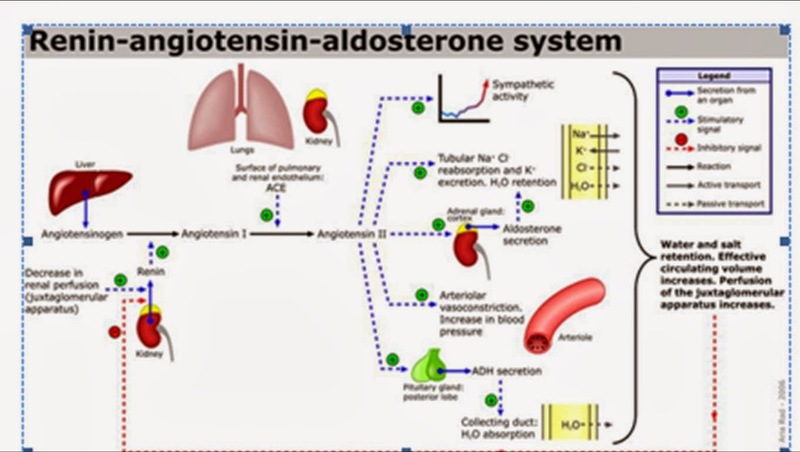 Blood tests: Kalemia =1.77mmol/l ( N= 3,5-5), Aldosterone = 380pg/ml ( N= 10-210). 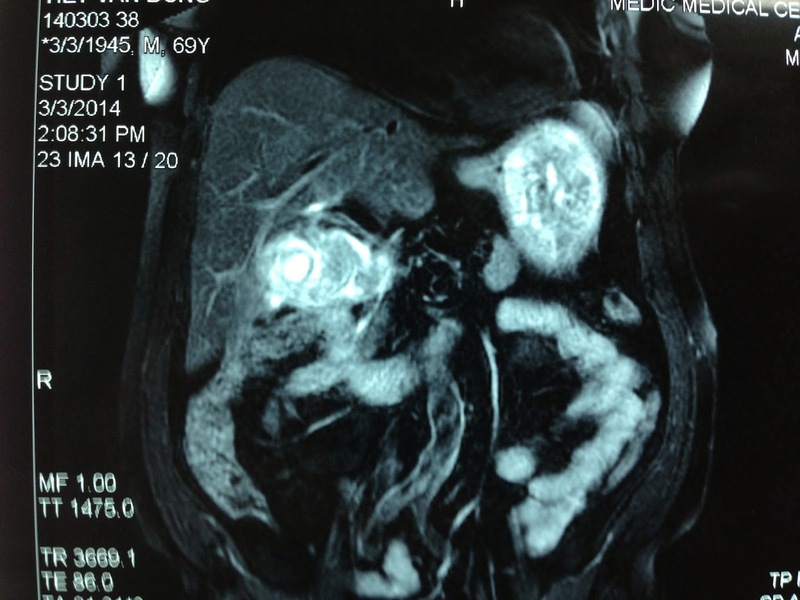 Operation was done and microscopic report was a benign adrenal tumor.